Tim Campbell was born to entertain. The House Husbands, Dancing with the Stars, and Home and Away talent has spent years working his way through the Aussie arts scene as a singer, actor, and TV host. He’s with new release High School Disco, bringing us the best hits from the ’70s and ’80s. So how does it feel to spend a life entertaining others in every way possible? “The fact that I can do a job I love and still pay the house off, I’m very lucky and very happy,” Tim says. While he may certainly seem like a natural, Tim was in fact a late bloomer when it comes to the performing arts. Raised in a family whose careers were centred on accounting and finance, the choice to become an entertainer was supported, but unexpected. 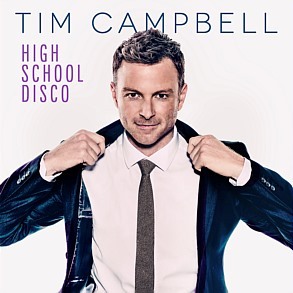 Songs like ‘Shake Your Groove Thing’ and ‘I’m a Believer’ are revived through Tim’s new release High School Disco, taking him back to the days of his youth.